Let’s face it, we all feel that 24 hours isn’t enough to get our work done in a day. From planning out work duties to cooking at home and achieving that almost mythical work-life balance we’re all struggling on some level to manage our time properly. Back in the day, 24 hours used to be enough to work, study, enjoy quality family time and indulge in hobbies too. But our work load has increased and of course, our time management hasn’t shown a proportionate development. So if you’re struggling with juggling the many duties you need to get through every day, here’s some help that can prove useful to you. When are you writing up that to-do list? Alright so when are you really going to set up a to-do list for each day? It’s one of the most simple and basic ways to try and get yourself a time management tune up without too much effort. If you are working in an office, you already have the majority of the time management done for you such as regulated break times, start and finish times and so on. But when you work a freelancer or if you are having your own business, you are essentially your boss. You get to decide when you wake up and when you eat and when you work. But you have to keep it realistic. That’s why self-discipline and clear direction is super important. Setting up a list of things to get done in order of priority every day is the key to at least finishing ¾ of that or better. It’s also one of the most beneficial productivity hacks that you could come up with. It tells you what you need to do today, what your deadline is and how well you are doing halfway into the day. Go on, set up your list right now and if you need any help this blog will come in handy. We all have those tedious tasks that really give our brains a tickle and of course a good migraine or two. These are the tasks that loom ahead of you like the giant iceberg in the way of the Titanic, so to speak. You know what’s going to happen if you don’t avoid that collision course right? When you plan out your day, tackle the hardest, most time-consuming tasks in the beginning while your mind is fresh and your body doesn’t feel tired. The more you push it off for later in the day the bigger the chances that your mind is going to tell you to put it off till the next day when you don’t feel so exhausted. The little tasks are the ones that you need to take on while your productivity is on the low. This all boils down to practicality. Want to know why else you should study practical time management? Here’s why. Huffing and puffing through your work day with your temper off the charts and frustration on natural disaster levels won’t let you be productive. In fact. It’s going to slow you down and make you churn out low quality work that will eventually come back to you for revisions. That’s double time right there. So the bottom line here is to work smart not hard, but how? Delegate when you should and can. Every successful professional is great at routinely delegating their tasks to the right people for better focus and good results. This doesn’t mean that you write off all your tasks to everyone else and relax, it just means that you give certain tasks to those in your team who excel at it and focus on the core capabilities you have. Give the person you are delegating to, the right background for the task, all the information they need, the deadline and ask them to keep you in the loop. Differentiate between strategic and ‘brain-dead’ tasks. When you need to get creative, innovative and conceptualise, do it while you are fresh and inspired. When it is one hour to go before the end of your work day, handle your data entry or filing systems. Look after yourself. You cannot expect to work all through the night and feel like you are ready to climb Everest in the morning. Give yourself quality time at home(don’t take your work home), enjoy your meals, get at least 8 hours of sleep and wake up fresh and rearing to go. Use your weekends to travel, relax and play a sport you enjoy. Educate yourself. Being stressed will take a toll on your health, family life and career. Join a program like a Diploma in controlling stress and time management that can help you not only sort out your time and stress, but that of your team as well and gain better results. 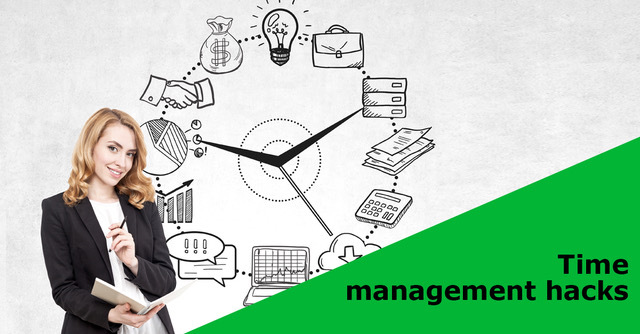 If you were wondering why it’s important to learn time management all this, here are some reasons why time and stress management is essential for work-life success. Do you feel the need to say yes to every task that is assigned to you? Well, that’s fantastic spirit and work ethic but is it the right one? Sometimes saying no for the right reasons is the best work ethic that you can adopt. Juggling too many tasks at once will mean that you spread yourself too thin and would probably not be able to deliver good quality in anything you do. If you must say yes, ask for the right amount of time to complete those tasks and backup your no with your reason for saying so. Your manager, team leader or client will understand a well-negotiated and effective no always. Go on and achieve your targets and just bask in your complete potential! 0 responses on "Time Management Hacks"